SLC Arts Announces 2017 Grant Recipients! Since 2008, SLC Arts has administered the New York State Council on the Arts (NYSCA) Decentralization Program in Jefferson, Lewis, and St. Lawrence Counties. Statewide, this program distributes over $4,000,000 to individual artists, municipalities, libraries, and non-profit organizations for the purpose of funding community-based arts and cultural projects. For 2017, our tri-county region receives $71,400 in Decentralization funds. Using this funding, SLC Arts offers three grant opportunities: Public Art Fellowship, Teaching Artists’ Fund, and Community Arts Grant. At this time, we’d like to announce and congratulate our 2017 grant recipients. 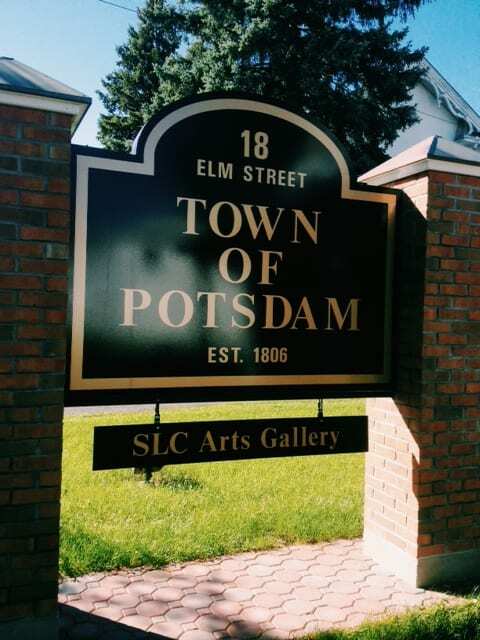 Artist Catherine LaPointe Vollmer (Potsdam) will collect submissions of original children’s poetry from the tri-county area; ten poems will be chosen by the artist to illustrate. When completed, the artist and authors will present their work at the Potsdam Public Library’s Story Time. With community input, and in partnership with the Potsdam Humane Society, Artist Irja Boden (Colton) will use pet adoption photos gathered from the community to inspire and create ten 3’ x 5’ coloring posters, which the community will then be invited to color at shelter events. With hands-on contributions from the community, Artist Cynthia Brownell (Lowville) will organize and create a ceramic mosaic wall mural, to be installed on the wall of the Lyons Falls Riverside Park’s public restroom building. Artist Bill Newman (Canton) will work with students from the Canton Central School Technical Theater class to design and create backdrops to be used in the school’s two 2017 theatre productions. In partnership with the Macsherry Library, Hearts for Youth Inc. (Alexandria Bay) will offer a set of hands-on painting and photography classes for youth, grades K-12. Artist Len Mackey (Canton) will partner with Little River Community School to present a creative and cultural education program, for grades K-12, which encompasses multiple art genres, including storytelling, music, song writing, and visual arts. Artist Patricia VanPatten will work with Madrid-Waddington High School to teach students techniques for the construction and painting of moveable sets and backdrops, which will be used for the school’s theatrical productions. Artist Sara Lynch will partner with Lawrence Avenue Elementary School to bring a 4th grade social studies curriculum to life through a series of sequential hands-on art lessons. The DeKalb Historical Association (DeKalb) will present a series of evening concerts, with music tied to past traditions; featuring hymns from 1830’s, fiddle music and historic patriotic songs. The Sackets Harbor Battlefield Alliance (Sackets Harbor) will offer interactive “Live History” theatrical presentations at its national historic site. The Lewis County Historical Society (Lowville) will present two winter concerts, featuring talented regional artists. The Morristown Gateway Museum (Morristown) will present a series of nine musical events in July and August. The Young People’s Theater of Clayton (Clayton) will host a week-long musical theater experience for young people, ages 5-18, which teaches acting, teaching and choreography, and ultimately culminates in a junior production of The Little Mermaid. The Town of Lewis Library (Lowville) will offer two, independent, summer projects. (1) the guided creation of a painted, framed picture; (2) a performance by Merry Go Round Playhouse. The Canton Free Library (Canton) will offer four two-hour workshops to teach children basic storyboarding and digital storytelling using stop-motion software. The Clifton-Fine Economic Development Corporation (Wanakena) will present seven summer concerts, featuring various genres of music. The Sackets Harbor Vocal Arts Ensemble (Sackets Harbor) will present a spring concert, featuring local and regional musicians performing the work of three classical composers. The Colton Historical Society (Colton) will present the musical, Working, a production that combines local history, education, and live musical theater. The Massena Chamber of Commerce (Massena) will present a series of ten summer concerts, featuring artists of various genres, as well as concert-time kids’ projects. The Arts Community of Lewis County (Lowville) will offer an alternative-content film series featuring films from various genres that have been influential to culture and the film industry that are entertaining to view in a theater and drive-in theater setting. It will also host a festival that includes a diverse line-up of activities and artisanal exhibits, celebrating children’s art and talent of all ages and skill levels. The Sackets Harbor Historical Society (Sackets Harbor) will present a collection of four musical performances of various genres, which share a jazz influence. The Town of Colton (Colton) will present a series of five musical performances, featuring local artists. The Chippewa Bay Community Club (Chippewa Bay) will present an evening concert series, highlighting culturally diverse music. The Northern Lights Orchestra (Canton) will perform a series of seven, live orchestral concerts, presented to regional audiences throughout St. Lawrence County. What a Raquette Music & Dance (Potsdam) will present a series of seven Saturday concerts, featuring a wide range of musical styles, including a children’s concert. Congratulations to ALL of our grant recipients! Each of these projects is made possible with funds from the Decentralization Program, a regrant program of the New York State Council on the Arts with the support of Governor Andrew Cuomo and the New York State Legislature and administered by the St. Lawrence County Arts Council. For more information on the SLC Arts Regrant Program, please visit www.slcartscouncil.org/grants, or contact Alicia Murphy, Regrants & Community Engagement Coordinator, at 315-265-6860 or arts@slcartscouncil.org.